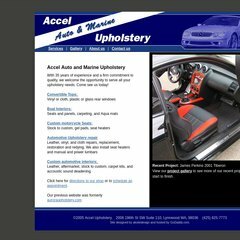 Topics: Services, Gallery, and Automotive Upholstery Repair. ns08.domaincontrol.com, and ns07.domaincontrol.com are its DNS Nameservers. It is hosted by Godaddy.com Inc (Arizona, Scottsdale,) using Microsoft-IIS/6 web server. It is written for ASP.NET language. PING (68.178.211.125) 56(84) bytes of data. A ping speed test response, is timed at 64.5 ms.